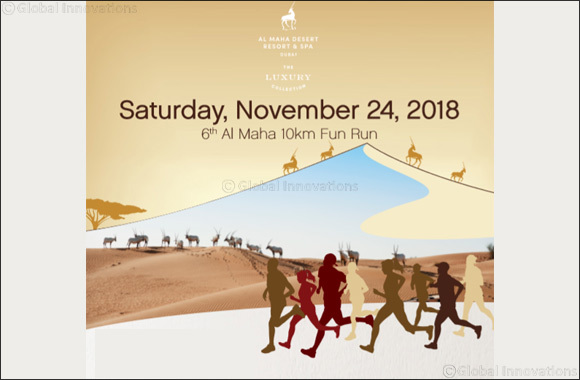 Dubai, UAE, November 06, 2018: With an aim to promote fitness and a healthy lifestyle, Al Maha, A Luxury Collection, Desert Resort & Spa is all geared up to launch their 6th edition of the Al Maha 10km Fun Run at the Dubai Desert Conservation Reserve on Sunday, November 24th, 2018. Set in the midst of the royal Arabian dessert, Al Maha Fun Run encourages fitness buffs of Dubai, and neighbouring emirates, to participate and run for a philanthropic cause. Located in the heart of the Dubai Desert Conservation Reserve (DDCR), Al Maha’s fabled charm is a nod to the Bedouin way of life and this desert resort epitomises the heritage and culture of the desert environment. Al Maha plays a significant role in achieving and maintaining the conservation objectives of DDCR whilst allowing guests to experience the natural beauty and biodiversity of the Arabian Desert. Linked to the ‘Road to Awareness’ initiative, a Marriott fundraiser campaign, Al Maha 10km Fun Run is organised in association with Al Jalila foundation, a global philanthropic organisation dedicated to improving the Arab world by transforming lives through medical education, research and humanitarian work. All proceeds from the event will benefit the Al Jalila foundation. Participants at the Al Maha 10km Fun Run can choose to run, walk or jog in a benevolent race to support Al Jalila foundation’s humanitarian causes. For AED 100, participants can enjoy Al Maha’s mesmerising surrounding while running along the dedicated track road that winds its way through golden sand dunes. The enchanting track will end at the desert event site, where runners can replenish and cool off with post-race fruit feast during the prize distribution ceremony. Runners at the Al Maha 10km Fun Run will be given a raffle ticket, which will be entered into a draw that will be announced at 6 pm. Lucky winners of the grand draw will win amazing prizes including Al Maha day packages as well as an overnight stay at the resort, valued over AED 10,000. “We are extremely excited about our 6th edition of Al Maha 10km Fun Run, to promote a healthy, active lifestyle while supporting the philanthropic endeavours of Al Jalila Foundation. We invite nature lovers and fitness enthusiasts to be a part of the exciting race that winds along golden sand dunes and experience the world of Arabian wildlife,” says Patrick Antaki – Complex General Manager, Le Meridien Al Aqah, Fujairah and Al Maha, A Luxury Collection Desert Resort & Spa.